CapitaLand to buy over Temasek’s stake in Ascendas-Singbridge Group for S$11bn. The target company is an established business solutions provider with core expertise in the business park and logistics space with an AUM of S$23.6bn. Complementary exposures with synergies and value to be extracted over time. While proforma gearing hits a high of 0.72x, there are plans to realise value through ongoing capital recycling and stronger cashflows to reduce gearing towards 0.6x. CapitaLand to buy Temasek’s stake in Ascendas-Singbridge. CAPITALAND LIMITED (SGX:C31) is proposing to buy over Temasek’s stake in Ascendas and Singbridge Group (ASB) for S$6.035bn (enterprise value of S$10.9bn, including debt and MI). The consideration will be paid in 50% cash (which will be funded by debt) and 50% in shares in CapitaLand (priced at 11.3% premium at S$3.50/share) to Temasek. Post deal, after accounting for the shares to be issued, Temasek's stake in CapitaLand will rise from 40.8% to 51% upon the close of the transaction. an implied 15-16x PE on Ascendas-Singbridge’s fund management platform. a rise in ROE to 8.88% (vs 8.40%). The deal is subject to an EGM to be convened in 1H19 for shareholders of CapitaLand. Ascendas-Singbridge Group (ASB) is a leading provider of business space solutions with a business presence spanning 11 countries including Singapore, China, India, Australia, UK and the US. Ascendas-Singbridge has an AUM of S$23.6bn, out of which 80% is in business spaces, from which more than half are in the new economy sectors of business parks and logistics facilities in Singapore, India and China. Similar to CapitaLand, Ascendas-Singbridge has interests in and manages three REITs (ASCENDAS REAL ESTATE INV TRUST (SGX:A17U), ASCENDAS INDIA TRUST (SGX:CY6U) and ASCENDAS HOSPITALITY TRUST (SGX:Q1P)) which are mainly in the IT/Business Parks and hospitality space. These subsectors are not key sectors that CapitaLand has expertise in. 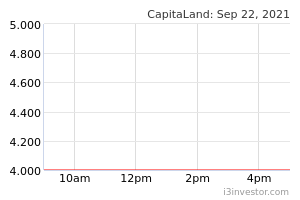 Current CapitaLand share price is undervalued. Pricing new shares at a premium to its current share price will be a positive for CapitaLand's share price as it implies that the stock remains under-valued at 0.7x P/NAV. While we note that the issue price is below CapitaLand’s NAV, we do see the stock closing the gap post announcement of this deal. Valuation paid for ASB reflects its “leadership status” in Asia. Investors may question the “premium” valuation paid by CapitaLand for Ascendas-Singbridge (1x P/NAV and implied 15-16x P/E for its fund management business) compared to opportunities in the listed space. However, we do note that CapitaLand inherits an established leader in the business parks and industrial space in Asia. Value to be extracted will come from asset recycling activities to realise value on the book to its listed REITs, where cost of capital remains conducive. This strategy has been “tried and tested” and we believe it will be a low hanging fruit for the group. Complementary addition to CapitaLand and adds significant scale to CapitaLand AUM. At this point, we believe that the deal is more complementary than synergistic as we see that both groups’ entities are fairly complementary with minimal overlaps. The widening of CapitaLand’s scope to include more “new economy” real estate sectors in the business parks and sectors could make the overall group more “future proof” as it navigates through the new world. Ascendas-Singbridge and Ascendas REIT are front runners in this space in Asia and will provide valuable experience. Ascendas-Singbridge is an established player in Singapore with leadership across the full value chain (developer, owner, operator, fund manager) with an AUM of S$23.6bn. The combined entity will increase CapitaLand’s AUM to close to S$116.5bn, making the group one of the 10 largest global real estate investment managers by AUM. Ascendas-Singbridge will also provide CapitaLand and its existing REITs with a larger pipeline of development properties which can be injected into their platforms in the medium term. We do note that Ascendas-Singbridge will offer CapitaLand capabilities in the commercial and business space value chain and at the same time, provide a strong foothold in the industrial, business park and logistics sectors. The combined scale and expertise of both CapitaLand and Ascendas-Singbridge will be complementary and enable the group to better capitalise on opportunities as a single entity. We note that the group will continue to drive more than 74% of its AUM in Singapore and China, core markets that both groups have significant scale in ownership and management, enabling them to attract a wide tenant base. The combined entity will make CapitaLand the leading REIT manager in Singapore, expanding its number of REITs and private equity funds to 31. Most importantly, Ascendas-Singbridge will allow the group to expand its exposure and capabilities in fund management to new asset classes and geographies. Over time, we see more opportunities for differentiated products and mandates to be launched to attract new capital partners. Both Ascendas-Singbridge and CapitaLand have also over time established track records in cultivating relationships with capital partners who could be tapped on to further invest in other funds or upcoming platforms that the combined entity will look to create in the future. According to CapitaLand, the combined fees generated is expected to rise to S$337m, a 40% increase. Synergies to be extracted post integration. The immediate plan is for the group to look at creating an optimal organisational structure with a target to seamlessly integrate human capital from both groups, aligning the group’s culture and vision. In the process, CapitaLand aims to identify synergies in complementary organisational capabilities and also look to the merger of the office and information systems over time. At the same time, the bigger platform will enable the group to redeploy talent to pursue growth. Immediate synergistic benefits are at this point unclear to us but we note that with a wider and global platform, the combined entity is able to possibly take on a wider range of opportunities that was never available to them on its own. Management believes that there will be some cost savings by having both groups housed together. In our view, while there could be overlaps in human capital and expertise but more opportunities are available to move talents across divisions. Deleveraging plans – REITs will continue to bulk up. With the proposed capital structure, the group’s proforma gearing of 0.72x, while at the higher end of the group’s historical range, remains at a comfortable level. The group has also unveiled a plan to deleverage to 0.64x by end-2020 which could be achieved through asset recycling (annual target of S$3.0bn) and higher cash on operations. There are ample opportunities for asset recycling on the balance sheet of the combined entity, being China properties in the retail space and business parks in Singapore, which will form a pipeline for Ascendas REIT to acquire. India – ASB has a successful platform. While CapitaLand experience in India has been “bitter-sweet” over time, the group will inherit a fairly successful India franchise in Ascendas-Singbridge and Ascendas India Trust which has been the first mover in the IT Parks and warehouse space. In fact, Ascendas India Trust is one of the fastest growing REITs with an in-built growth pipeline of developments and acquisitions. We believe that Ascendas India Trust can grow even faster if not constrained by capital. With a bigger entity, we hope to see more capital allocations into India over time. Any further M&A among its existing REITs? Existing REIT vehicles under CapitaLand and Ascendas-Singbridge are leaders in existing real estate class in Singapore: CAPITALAND MALL TRUST (SGX:C38U) (retail in Singapore), CAPITALAND COMMERCIAL TRUST (SGX:C61U) (in commercial), ASCOTT RESIDENCE TRUST (SGX:A68U) (serviced residences globally), Ascendas REIT (industrial properties in Singapore, Australia and UK), Ascendas India Trust (business parks in India) which we believe will benefit from a sponsor with bigger operational scale. In the longer term, we do note the mid-sized market cap REITs like CAPITALAND RETAIL CHINA TRUST (SGX:AU8U) will have to bulk up in size in order to fulfil their destiny as an effective recycling vehicle for the group. While we do see similarities between ASCENDAS HOSPITALITY TRUST (SGX:Q1P) and Ascott REIT in terms of exposure (both in the hospitality sector) and mandates, investors might speculate of a merger between the two. While both are different in terms of their exposure in the hospitality sector, the current disruption in the hospitality space by new-economy companies like Airbnb could make the group re-look its strategy in the medium term.